First Range Extended Electric 7M Light Bus in Hong Kong. Designed for typical intensive operation with frequent passenger loading and unloading. Powered by advance Siemens ELFA® electric drive system. Equipped with powerful Siemens on board generator that enables recharging whenever battery runs low. No more excessive down time for recharging and comprehensive vehicle recharging facilities. On board generator only runs at optimum speed to recharge battery, resulting in lower noise, substantially reduces emissions and improves fuel economy. Fuel economy saving up to 50% of conventional diesel light bus, additional cost of investment can be recovered within 30 months. 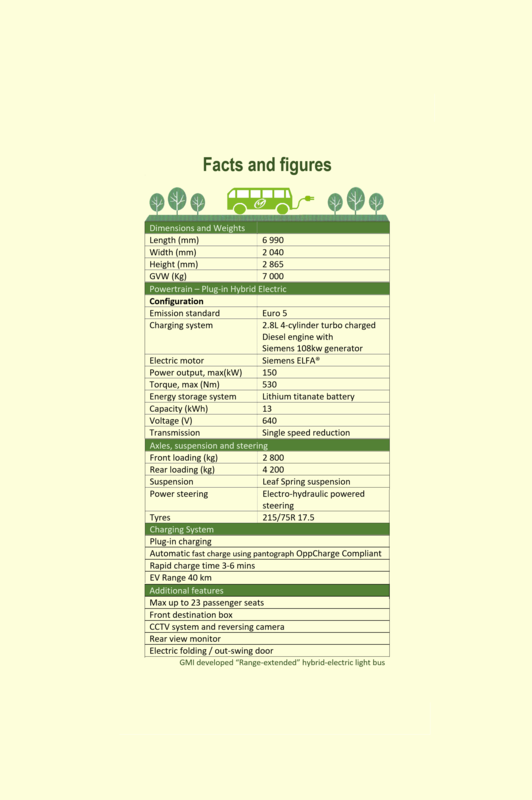 Comply with EURO V emission level, total reduction of carbon emission up to 70% of diesel light bus. Battery life significantly improved with carefully designed battery operation range. 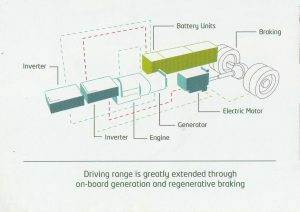 Simple mechanical construction of drive reduced maintenance requirement substantially. Achieving the win-win target by enhancing cost effectiveness and environmentally protection, “the more you drive, the more you save”.